This is an orthomosaic of the Apollo 17 landing site created from images provided by the Lunar Reconnaissance Orbiter Camera (LROC) Narrow Angle Camera (NAC). 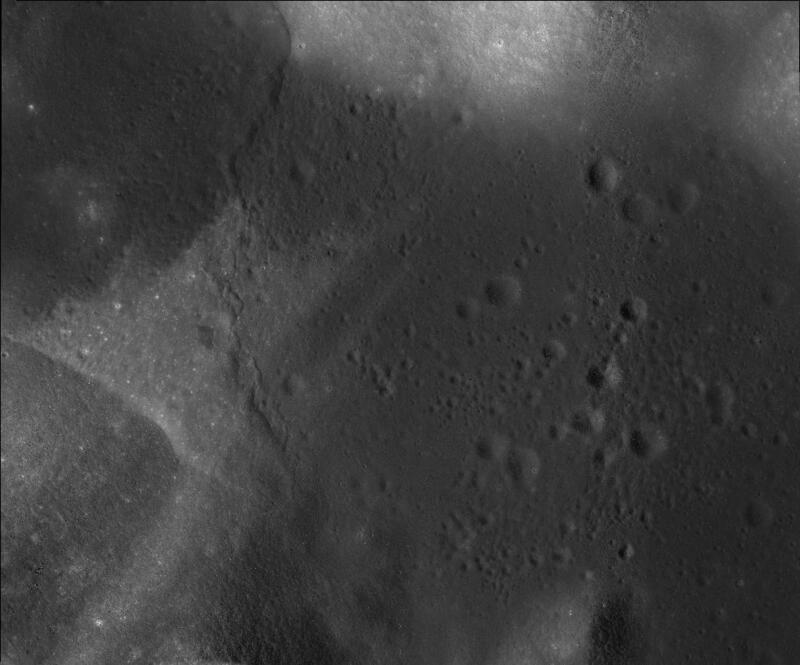 The images were acquired at 0.25-0.5 m/pixel resolution and orthorectified using related 1.5 m scale LROC NAC DEMs. For lateral control we used the Mean Earth/Polar Axis-coordinates of the ALSEP central station given by Davies and Colvin (2000). A 0.25 m/pixel resolution LROC NAC orthoimage acquired from low orbit altitude is provided as ancillary product (M168000580R). A DEM covering the same region as the orthomosaic is available as related product. The DEM and the orthomosaic were used to cartographically analyze the Taurus-Littrow Valley, to determine astronaut and feature positions, and to create a new Apollo 17 landing site map. Different maps of the landing site and the individual traverse stations are available as related products. Shapefiles of the mapped traverse and feature coordinates are available as ancillary products and should be viewed and used in conjunction with the provided orthomosaic or the 0.25m/pixel orthoimage (to ensure the same georeference). We also used the DEM and orthomosaic to synthetically generate a pair of stereoscopic images that we combined to a 3D anaglyph (red-cyan), which is available as derived product. Reference: Haase, I., Wählisch, M., Gläser, P., Oberst, J., Robinson, M. S., Coordinates and Maps of the Apollo 17 Landing Site, Earth and Space Science, under review. Davies, M. and Colvin, T., 2000, Lunar Coordinates in the Regions of Apollo Landers, American Geophysical Union, V.105:E8 pp.20277-20280. The orthomosaic of the Taurus-Littrow Valley on the Moon was created to support Apollo 17 landing site analysis and was used as the image component of a new Apollo 17 landing site map. The orthomosaic is referenced to the Mean Earth/Polar Axis-coordinates of the ALSEP radio transmitter (housed by the central station) given by Davies and Colvin (2000) and thus only as accurate as the coordinates derived from interferometry (~10 m). The orthomosaic consists of ten orthorectified LROC NAC images at 0.5 m/pixel resolution. Their incidence angles range from 22° to 64° and all of the images were acquired in slew mode (off-nadir). Five of the images have previously been used for DEM processing. The geometrically corrected, overlapping images were registered to each other and merged into a mosaic by using the DLR radiometric mosaicing tool. It is capable of adjusting the brightness of adjacent, overlapping images and to produce seamless transitions from image to image by weighted averaging of overlapping image parts. See Haase et al. (2018) for a detailed description of the creation of the DEM, the orthomosaic, and the determination of astronaut and feature positions.